Against our better judgement, we spoke with the Red Army communist network, Buckeye Battle Cry and asked a few questions about Coach Hazell and what we can/should expect. Despite the busy schedule they have for their bowl coverage, they were very accomodating. BS: Should we be excited by Hazell? Why or why not? BBC: Absolutely. A great coach, well respected by those at Ohio State and loved by former players. Even the guys in the media who cover Ohio Sports, in Columbus and at Kent State, say that he's a good coach but an even better person. Purdue is in good hands. For what it's worth, before leaving for Kent State, he held the title of Assistant Head Coach at OSU, and was believed to be the "heir apparent" once Coach Tressel stepped down. He left for Kent early in the spring; had he waited, it's likely that he would have been leading the team last season rather than Luke Fickell. It's also worth noting that a number of Ohio State fans would have no problem with him returning to the OSU sidelines later in his career... which, given how spoiled we've been with great coaches, should say something. BS: What will he bring to the table? BBC: Other than a legacy of success at multiple levels, I think he's been able to do two significant things. First, he's a good teacher and someone who can bring people to believe in themselves and in each other - look no further than what's happened at Kent this year; after a collapse against Kentucky, the team rallied and really bought into his plan for the rest of the season. Secondly, he's got a creative offensive mind; I'll talk more about this in a bit. BS: He seems to be a guy who always looks prepared and confident. Is he? BBC: From everything I've heard, he is... some of this could be a result of learning under "The Senator," but I believe that his passion for his players and program pushes him to be ready for any contingency. BS: Purdue fans worry he'll only run the ball but good coaches work to their players' strengths -- agree? BBC: Interestingly enough, we often referred to him as the "anti-Bollman"; Ohio State's offensive line coach and offensive coordinator who really really liked to run the ball into A gap over and over and over. During the 2010 season, though, Coach Hazell was the one who pushed for the offense to start diversifying and embrace the passing game- you might remember that the Rose Bowl win against Oregon opened with a barrage of passing plays; most insiders believe that this was Coach Hazell's influence on the gameplan and a direct response to his work with Ohio State's receiving corps during that season. 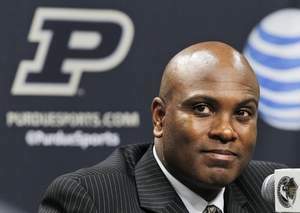 BS: Does he make Purdue more of a player in the Big Ten in your opinion? BBC: I think he does -- from his ability to get Boiler fans to buy into the program, to his connections as a recruiter in Ohio and Florida, his being on your sidelines is a great thing for Purdue. Plus, it makes you all that harder to dislike... although, I'm sure we'll find a way. Thanks to the BBC for agreeing to answer our questions. Feel free to stop by there for.... well, whatever it is someone would go to an OSU blog for.